For the 2010 season, McHale the bale wrapper specialists have introduced a new model, the 991 High Speed, a bale wrapper, which can deliver 50% more output. "We have tested the 991 High Speed against the 991BE (a machine which is recognised in the market place as having an output of 60 bales per hour), for the test we made sure that oil flow and table rotations were the same, what we found was the 991 High Speed could wrap 3 bales while the 991BE could wrap two. 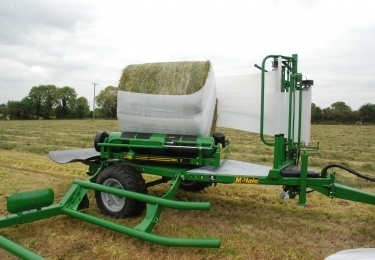 Therefore it is fair to say that the 991 High Speed has 50% more output or can wrap 3 bales, while a similar single dispenser machine wraps two.